Brisbane's infamous "man in black", Jack Sim, walks the shadowy streets of town in search of stories and tales of horrible history. Since childhood, those long years ago, he has been fascinated not by blocks, bikes or cars, but by the stories of the past, especially crime stories, ghost tales and jail birds. Jack has dedicated his life to preserving the details of things and subjects that we all find both macabre and thrilling. He has published several crime titles, regularly hosts crime and ghost tours around Brisbane and appears on radio 4BC each Monday night for Crime @ Nine. Join Jack Sim for a thrilling story or two. Bookings essential. Join us in welcoming Brisbane's infamous "man in black", Jack Sim to Brisbane Dymocks this March. Jack will share his intimate knowledge of stories of Brisbanes past, especially crime stories, ghost tales and most unscrupulous jail birds. Jack Sim has dedicated his life to preserving the details of things and subjects that all of us find both macabre and thrilling. Since last century Jack Sim has become an iconic character in SouthernQueensland, seen late at night undertaking his Crime Tours and Ghost Tours, with a collection of other knowledgeable hosts, in historic sites such as Boggo Road Gaol, Toowong Cemetery and South Brisbane Cemetery. His work promoting history and heritage to visitors and locals has been seen in national and international media and documentaries such as Getaway, Extra, and the Seven Network's Great South East. He has strived to gain greater recognition for the value of storytelling and oral history and he has been the longest running operator of ghost tours on mainland Australia. Jack Sim has also earned himself many fans presenting Crime @ Nine with Walter Williams every Monday evening on radio 4BC (1116am), where he discusses true crime, from Brisbane and international history, some infamous, others long forgotten. As well as a guest on the Paranormal Panel with Tino Pezzimenti from UFO Research Queensland discussing all things paranormal. Join this dark historian as he strives to undertake us on a journey to the unpleasant side of society, that no-one knew existed or wanted to. This event is free but bookings essential. Books will be available to purchase at the event. Coming up this Sunday 26th of February is the 10th Anniversary Logan Car Show and it's going to be a big one! Forty-five years ago, when Johnny Cash first came to Australia in March 1971, the "Man in Black" was at the high of his fame. John's passion to play live for his fans led him to come down under on the back of a relentless tour circuit that had criss-crossed the U.S.A.
A little known detail is that John wanted his music to reach everyone - including those inside the worst jail in Australia. Boggo Road's reputation extended far beyond the Queensland border. The Sunshine State then was regarded as a police state, ruled by Premier Joh Bjelke-Petersen and an assembly of corrupt cops and criminals. If there was a place where the sun never shone, it was inside the walls of "Boggo". So through Boggo's gates strode Johnny Cash, a living legend, somehow given permission to sing to a small hand-picked group of prisoners in the concert hall of No1 Division. No press, no fuss. He played and sung his songs to men serving some of the hardest time in the country including lifers - just a man and his guitar. The details are scant and hard to verify, as many prison records - such as correspondence from that era - were destroyed long ago. Retired prison officer Bill Eaddows - who sadly has now passed away - recalled that Johnny actually played twice at Boggo in the 1970's - likely '71 and '73 - both times when Cash was touring Australia. Bill was a reliable source of info on Boggo's past - if he said Johnny played at Boggo he did. At this time a strict no photography rule applied inside all prisons so no known pictures exist. Johnny played Brisbane's Festival Hall on the night of Monday 29 March 1971 - the likely day he visited Boggo and the last show of his Australian Tour before he took off to New Zealand. Brisbane was the fourth city on the tour - beginning in Adelaide, then Melbourne's Festival Hall, then Randwick Racecourse Outdoor Theatre. Johnny brought his wife June Carter over to Australia along with six members of her famous country singing family, The Carters, her brothers and sisters. Johnny and June's year old baby son John came with them to Australia and together travelled the country in a caravan. John was no stranger to hard prisons. Folsom Prison Blues was recorded in 1955. The powerful line 'I shot a man in Reno, just to watch him die' followed Johnny everywhere; though many from his songs and he was widely believed to have served hard time himself. Thirteen years later he recorded it in Folsom State Prison on 13 January 1968 for his live album At Folsom Prison. Then, as now, Folsom was regarded as one of the most notorious prisons in California. Johnny returned to prison on 24 February 1969 and recorded Johnny Cash At San Quentin. Located across San Francisco Bay, it is one of the state's most infamous penitentiaries. On the back of his prison albums popularity Johnny was frequently invited to play at various U.S. prisons by officials. John was a passionate advocate for civil rights. By the early 1970s he was the most well-known advocate for reform of prisons. Like Jesus whose life Johnny deeply respected, he used his position to try to do some good. Somehow, according to Bill, Cash ended up at Boggo Road. 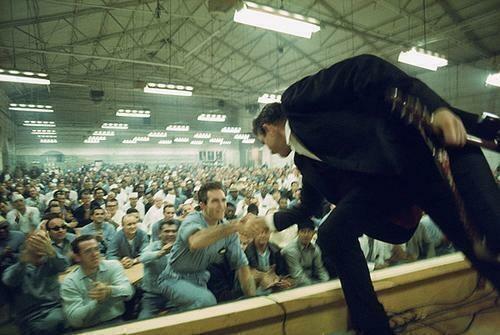 It is doubtful many of the prisoners who attended knew they were about to see Johnny Cash. It would not have been telegraphed. And it would have had to have been organised well in advance. A former prisoner at Boggo said he believed Johnny had been corresponding with a prisoner. This fits a pattern for Cash - quietly visiting prisons in the countries he went on tour - more than 20 operating prisons, some say 30 - including some in Sweden and Germany - were visited by Johnny. At each he played to inmates, some of whose letters he responded to. However things went awry for Cash in March 1973 - the second time he is said to have visited Boggo, again while on tour. There was some unspecified trouble, prisoners started to argue - over what no-one knows - and before he could finish his set John was apparently unceremoniously put out the gates - his guitar was thrown out after him. In no uncertain terms the Man in Black was told don't ever come back. As far as we are aware he never did. However Johnny Cash continued to draw attention to the dark issues surrounding incarceration for the rest of his career. As part of his national Far From Folsom concert Australian rock legend Tex Perkins has played at some of Australia's darkest historic prison sites, replaying At Folsom Prison in its entirity bringing Johnny Cash's music to new, and old audiences - relaying his messages of hope in the dark, and that from bad, good can grow. Far From Folsom has included concerts at Port Arthur, Old Melbourne Gaol , Adelaide Gaol and Freemantle Prison - ending at the only Australian prison John is known to have played at. Regarded as a living hell for the convicts that were sent there, today Norfolk Island is the opposite. This small, green island, surrounded by deep ferocious seas is a paradise compared to what it once was. The first convict settlement was established soon after the arrival of the first fleet to Australia in 1788: Through the 19th century the two more attempts to make Norfolk into an island prison ended in abandonment. The stories which came from those unfortunate enough to serve and be held on Norfolk were horrific. The commandants were sadistic and cruel, and used their powers over life and death to try to crush the souls of the men and women sent there. Brutal floggings with whips, deprivation of food and water, punishing work regimes and regular executions by hanging created a type of convict that mainland Australia rarely saw. For the convicts created here depravity and hopelessness was the norm. These circumstances have been fertile grounds for folklore, ghost and crime stories. Norfolk has scores of haunted houses, buildings and ruins. Locals have long enjoyed sharing yarns and tales of the myths and legends of their island. One of the most enduring ghost stories is that of the "Bloody Bridge" which we will be visiting on our Norfolk Island Ghost Tour in October. This stone bridge built by convicts was the scene of a horrific murder in which prisoners killed their overseer and disposed of his body by stuffing it into the stonework of the newly built bridge. There are several different versions told of the crime, but the bridge itself is an imposing and eerie place to visit and will be a highlight of the 3 day tour. We will also visit the ruins and Kingston the island's Gothic graveyard and also take in world class museums and displays. It really will be a trip of a lifetime Norfolk Island's convict history and hauntings is equal to Port Arthur. The Norfolk Island Ghost Tour will be conducted by Jack Sim, Director of Ghost Tours. Who has been gathering stories from the islanders and local historians.